If today is Wednesday, does that mean tomorrow is really and truly Thursday? Already? I propose that we eliminate Mondays from here going forward. Who's with me? I mean, a girl could really get used to this whole 4 day work week thing. I felt so rejuvenated from my long weekend that I decided to completely reorganize my closet and jewelry chest last night. For starters, Dee and I did a couple hours of shopping after work, so I needed to make space for my new stuff. Also, I think I must have been inspired by Carrie's closet in SATC, (both the tidiness and the contents, haha), and really wanted to be able to display all my cute summer clothes and shoes like she did. So I cranked up some new music on the iPod, (Karen Elson's new album The Ghost Who Walks), poured myself a glass of vino and grabbed my sketch pad to map out my "new" closet. Yeah, I'm a dork and drew it out on paper first, but trust me, it works much better this way. I'll be posting before and after pics as soon as I have an "after" pic to show you. So stay tuned. It's a work in progress. Alrighty, so how do we feel about crochet? Not actually doing it like with needles and yarn and stuff. Just wearing it. 3) Carry a structured bag. This rule kind of echoes #2, since a bag is always in close proximity to your body, (i.e. over your shoulder.) Try a satchel or structured tote in a bright color, as they're fun for summer and will pair nicely with the softness of the crochet. 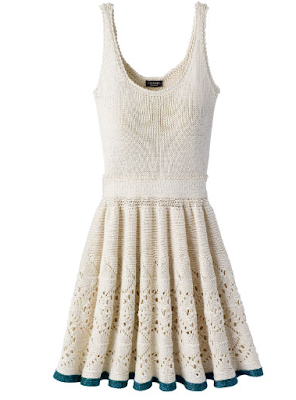 Have any of you guys tried the crochet trend yet this season? If so, where did you find your pieces? A woman came to one of my bridal showers wearing a crocheted top. And a bra. Yup. Cant wait to see your closet pics! I'm certainly loving crochet in those Charles David beauties! How did the sketching go? Did you / will you take before/after pics of your closet? Call me a dork, but I love a good closet reorganization! Hmmm....not sure how I feel about crochet on anything but a blanket on the back of a sofa. And I'm not even a big fan of it then. I like the purse and shoes. I think there is potential there. I also think the dress could work. If it's done with the right yarn, it won't look like your great grandma's blanket and can look great!